Bronwyn Bancroft is a descendant of the Bundjalung people of northern New South Wales. 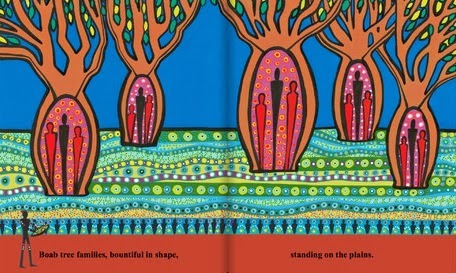 She is also an award-winning illustrator and a leading Australian artist. Fortunately for us, she has drawn on all these elements in this inspiringly exquisite tribute to the Australian landscape. Each double-page spread is breathtaking. 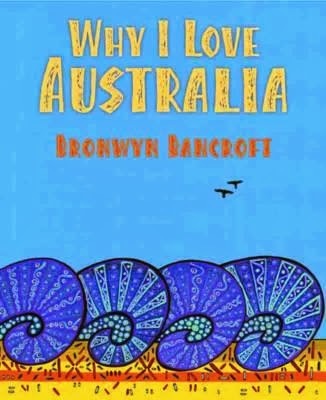 From the rich reds and ochres of the boab trees standing on the plains, to the indigos, violets and deepest black of our urban landscapes at night, Bronwyn Bancroft's precise use of colour and technique has succeeded in bringing a continent to life in a way that all ages will appreciate. A single line of text accompanies each picture, enhancing the beauty of the image in carefully chosen words. In each scene, there is a person holding a coolamon, a wooden bowl with smoke drifting from it. Among Aboriginal people, it is considered essential to pay tribute to the Ancestors of another Aboriginal person's lands, and one way of showing this respect is through taking part in a smoking ceremony. As Bronwyn explains to us, the person we see on each page is the host of each landscape, wishing us well as we visit his country and acknowledge the Ancestors of each place.